Every family knows that a kid’s trampoline can provide the entire family with hours and hours of fun! But the hard part is trying to work out the best trampoline for kids which is not just going to keep them busy but keep them safe as well. 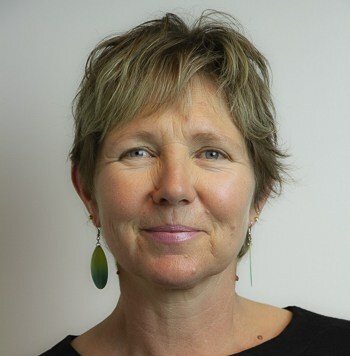 Myself and my four children have been using trampolines for over 20 years. We have had four of our own, two cheap and two great quality, and we are very clear on all that you need to know! Before you keep on reading, let me just say that if you have come to this article looking for recommendations on cheap trampolines for sale, then you are in the wrong place. Buying a cheap trampoline is not only a waste of money as they don’t last, but let’s be honest – they’re not the safest trampoline either so you’re putting your kids’ safety at risk too. 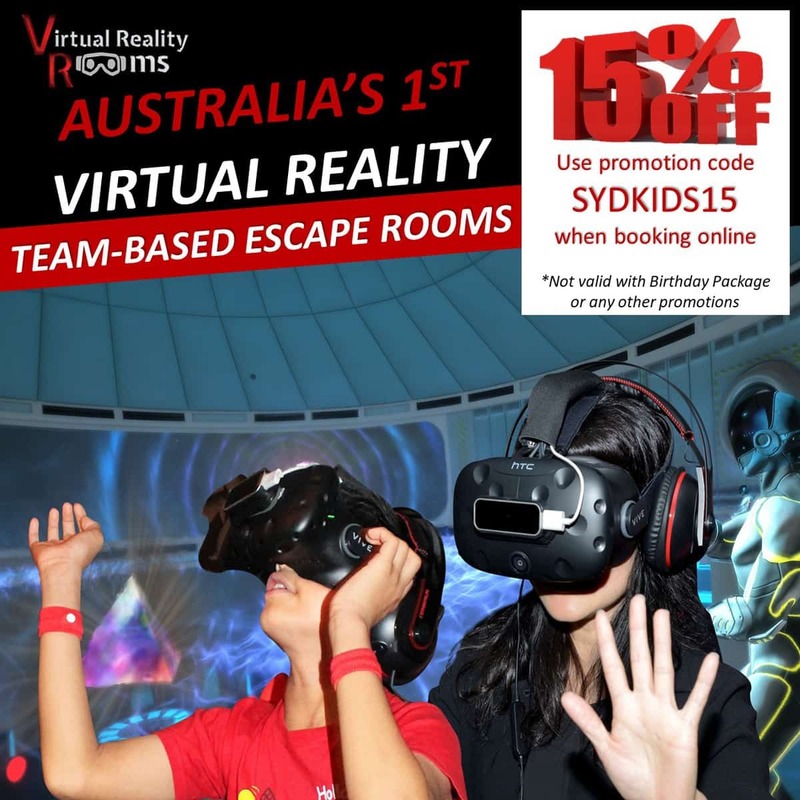 The best trampolines Australia has for sale are one’s that are durable, so they last for years, are safe to protect your children, and of course, provide hours of enjoyment for the whole family. 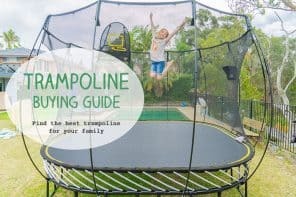 If you’re in the market for a children’s trampoline, save yourself from hours of research and check out this 2019 trampolines reviews guide I have put together. 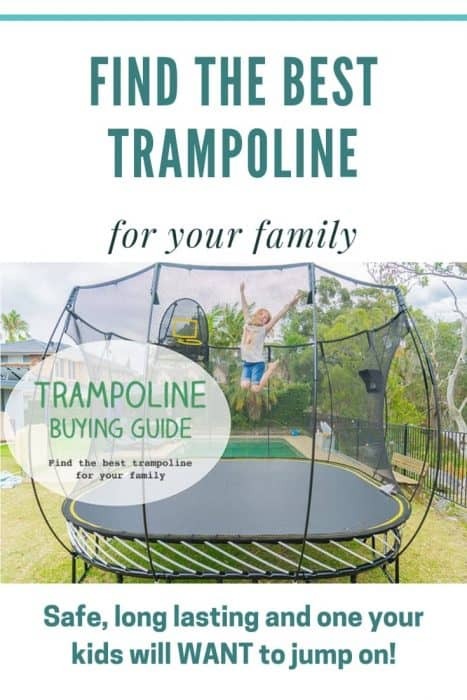 In this guide I take you through the various types of trampolines and what to look for when purchasing a trampoline so you can get the best buy trampoline for your family. 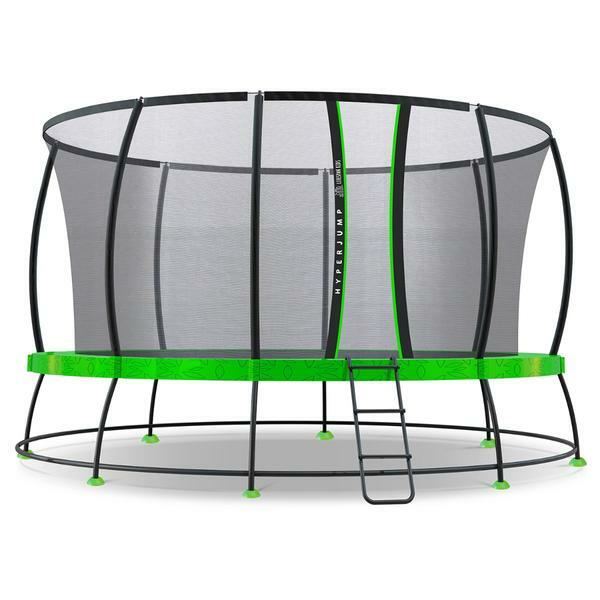 I’ll then take you through some of the top-rated trampolines currently and look at some options for the best springless trampoline, toddler trampoline, big trampoline, mini trampoline for kids as well as all the different trampoline sizes. This is a long post, you can use the Table of Contents below to hop around it. It’s no doubt that buying a good trampoline is a big investment, so you’re probably wondering if it’s even worth it. 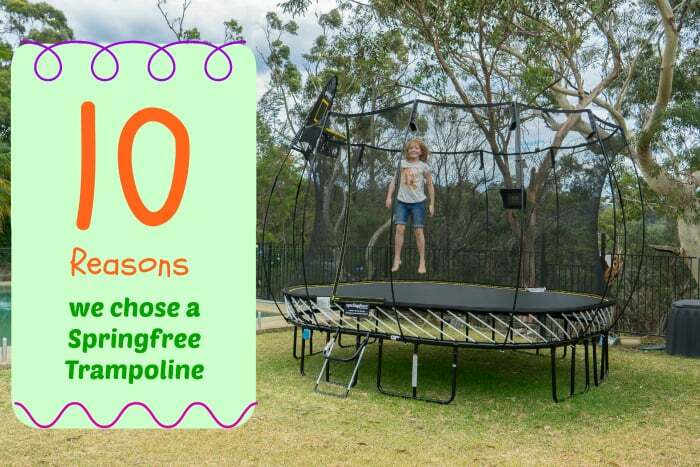 Well here are 5 reasons why I think every Australian family needs a quality backyard trampoline. 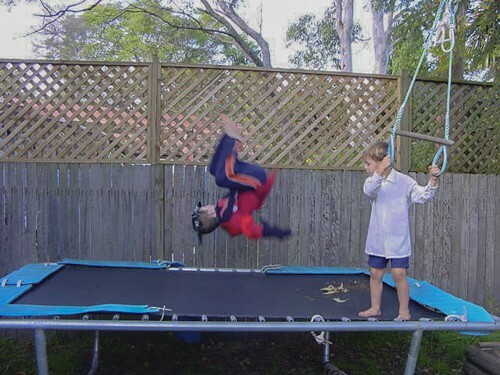 My kids are super busy and physical, the trampoline is a great way to really wear them out… at least for a short while. The trampoline has always made the backyard an appealing place for them to be. They love the adrenaline rush of jumping. It doesn’t take more than two or three bounces to get my heart racing. Even a few minutes at a time has got to be really good for we adults. Using the tgomaFit (a fitness app for adults) for a longer workout is, of course, even better. Often that means me watching the kids whilst they jump… they’re much more active than me. Sure, a trampoline’s purpose is to jump on it – but growing up as kids we used our trampoline for all sorts of things. It makes a great stage for putting on shows, kids can play with their dolls or cars on it and as they get older it provides a place for them to sit and chat with their friends. You don’t need to cover it up. Ours lasted through ten Aussie summers before the net needed replacing and some of the frame rusted a bit. Not bad going at all. Don’t have time to read my entire article and just want to know my recommendation for the best trampoline to buy? Well I think the Springfree Trampolines – check them out here- are amongst the best trampoline in the world. Over 20 years of watching my kids bounce their way through four trampolines, I can’t recommend the Spring Free trampoline enough. They are very very expensive… but you can find them second-hand, and a second-hand one will be better quality as opposed to a cheap, brand new one. Keep reading below to see why I think this variety of no spring trampoline is one of the best kids trampoline for sale. Of course, in these trampoline recommendations, I cover many different quality trampolines and not just the Springfree ones. The table below is a handy guide on the various top trampolines in these reviews and helps you easily compare the different trampolines and their features side by side. Keep reading below for the full review of each of these children’s trampolines for sale. NB This table looks MUCH better on desktop or laptop. I am working on improving it on mobile – sorry in the meantime! NB Most of these trampolines do some in several sizes, see the detailed reviews below. As mentioned above, my recommendation for the best home trampoline is the Springfree trampoline. We had our Springfree trampoline for 8 years before the kids wore it out, and they gave it a HUGE workout almost every day. So, despite how expensive it was to purchase, I found it a worthwhile investment and clearly the best choice trampoline. Given there are no springs on the Springfree trampolines, there is a bigger jumping surface with the mat going right to the net. And with no springs, of course there is less injuries as there is no chance of kids being caught up in the springs or falling onto the springs. So, if you’re looking for top rated trampolines for safety, this is it! The Springfree has flexible composite rods below the jumping kids. The net is firmly attached to the trampoline all the way round. With a Springfree, you simply cannot fall down the sides the way the kids did on one of our old, cheaper ones. And it lasts the life of the trampoline. Given how safe the kids feel on this trampoline they can bounce even higher! Seriously, the kids and I feel so safe inside the Springfree that we really go for it. We can see into the neighbour’s garden if we jump really high with all our might. These great trampolines are built to last and backed up by a whopping 10-year warranty! This is a heavy-duty trampoline, made with double powder coated galvanised steel frames for longevity and extra strength as well as UV resistant nets and mats to withstand the harsh Australian climate. Whilst the Springfree trampolines are the most expensive trampolines in these reviews, I honestly can’t recommend them enough, they are really good trampolines and hands down my pick for the best trampoline on the market today. These Springless trampolines also come in a range of other shapes and sizes including medium oval (8×11), large oval (13 x 8), large square (11 x 11) and jumbo round (13). 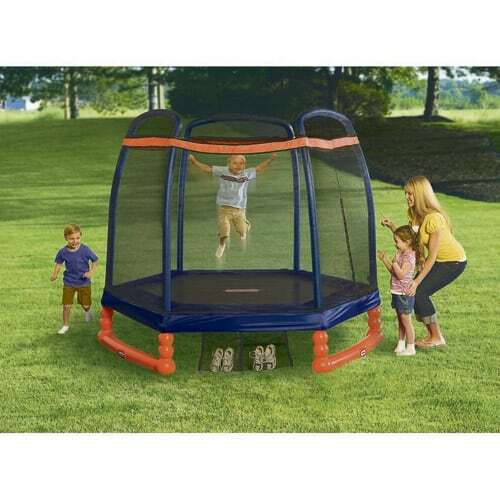 This Little Tikes trampoline is well worth considering for those families purchasing their first trampoline for their tiny tot. 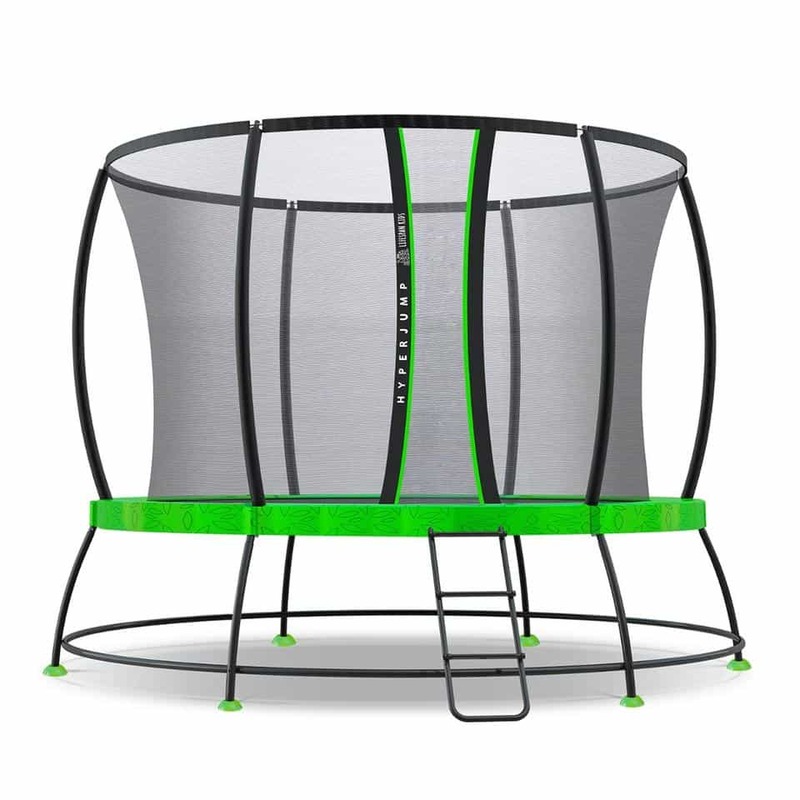 Despite being designed especially for toddlers, this junior trampoline has a surprisingly large jumping surface with a total diameter of 7ft. So, there is plenty of room for kids to jump around. This 7ft trampoline also has a large maximum weight capacity of 45 kgs. This little trampoline is made from durable and high-quality materials and for your child’s safety is fully enclosed as well as having a padded frame for added protection. 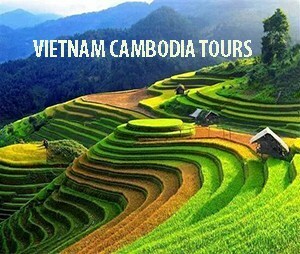 It is also very low to the ground, which removes the need for a ladder. A great bonus that parents will love is the shoe holder which attaches to the trampoline, so no more lost shoes! This is great first trampoline and with its large jumping area and high maximum weight, your kids will get plenty of use out it. Check out Little Tikes prices on Amazon here. 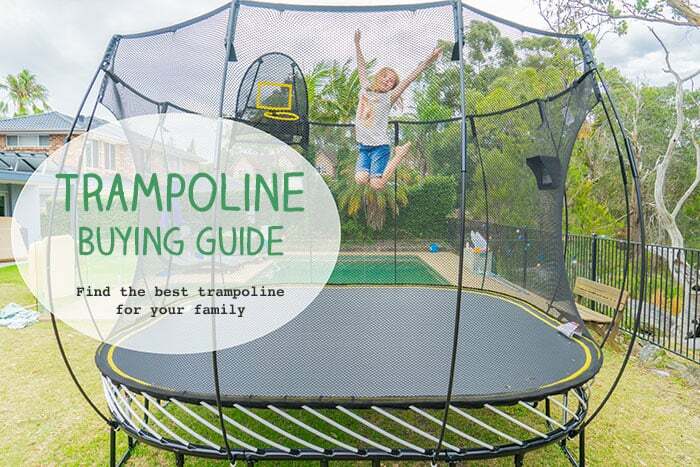 Whilst not that common in Australia, an in-ground trampoline makes a great choice for families wanting to reduce the safety risks that come with a standard trampoline. 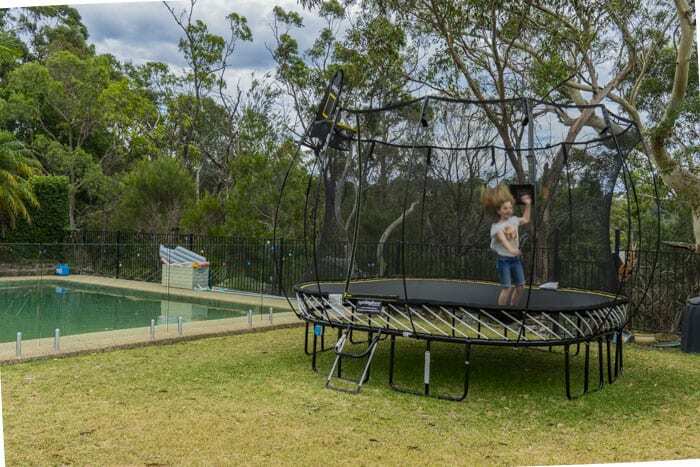 This inground trampoline by Oz Trampolines is Australia’s first purpose built in ground trampoline. The mat sits flush with the ground so there are no chances of children falling off. It also comes with a heavy duty jump mat made from the highest quality European materials and with 8.5-inch commercial grade springs which are fully covered with safety padding. 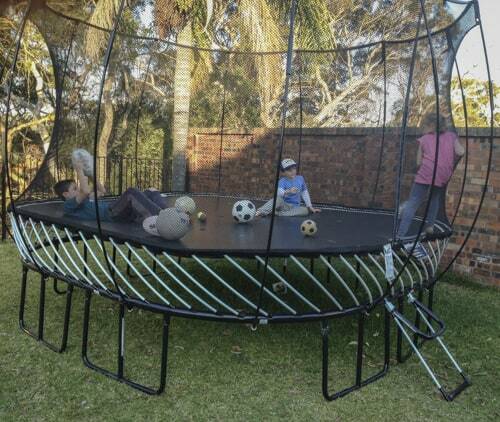 With a whopping 200kg weight capacity, the whole family will be able to jump on this large outdoor trampoline. It also comes in a range of shapes and sizes. The round size comes as an 8ft, 10ft, 12ft or 14ft trampoline, whilst the rectangle trampoline comes in sizes 8 x 11 ft or 10 x 14 ft. This trampoline comes with instructions for quick and easy DIY installation and includes a retaining wall to prevent soil from falling underneath the trampoline. Find prices for the In Ground Trampolines here. For a trampoline with a little extra something, try the Jumbroo 12 ft trampoline that comes with a basketball hoop! Made from premium materials including a fibreglass-made bounce pad, this trampoline is super-strong and has great safety standards. This trampoline with basketball hoop is fully enclosed with an extra-thick net and has a safety clipper and zipper entrance. The galvanised steel frame and springs are covered by soft foam sleeves, so the kids have extra protection against injuries. The trampoline and 2-step ladder are UV resistant and weather proof, so it will last out in the harsh Australian climate. With a maximum user weight of 120 kgs, the kids will have a ball jumping and playing hoops with their friends. 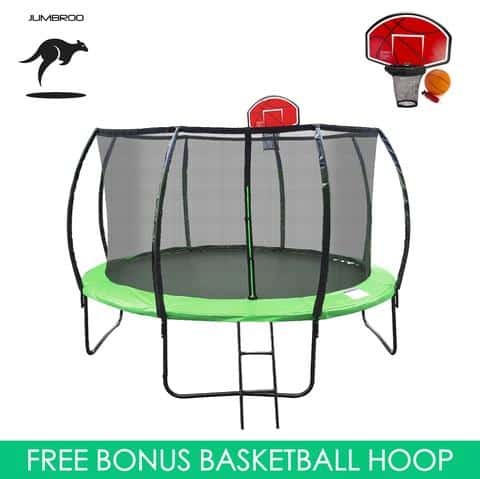 This Jumbroo trampoline with net is available in 6 sizes from 6 ft to 16ft, and they all come with the bonus basketball hoop. Also comes with a 12-month warranty. Check out pricing for this trampoline here. 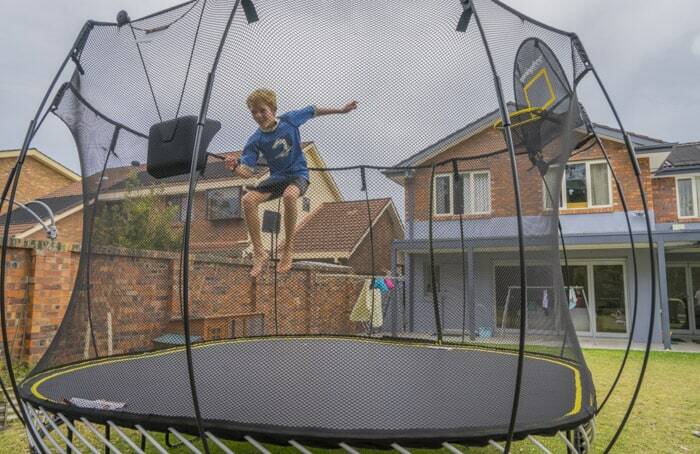 You can turn any room into a playground with the adorable 48-inch trampoline from Pure Fun. 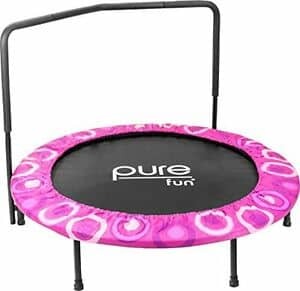 Recommended for children aged 3 to 10 years, and available in blue or pink, this miniature trampoline is the perfect trampoline to start your kids bouncing from a young age. 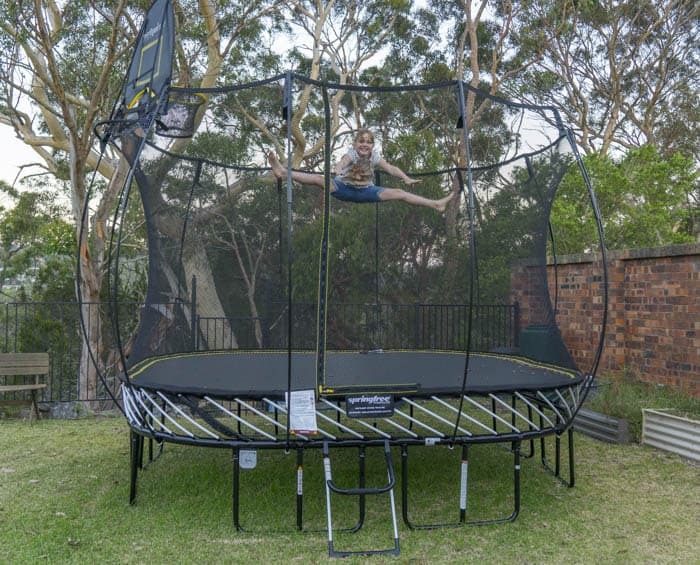 This children’s indoor trampoline has a 48-inch jumping surface and sturdy, galvanised steel springs, providing lots of space for children to safely bounce. The springs are protected by safety pads to prevent against spring pinching, while an ergonomic curved safety bar helps with stability and grip. With a maximum weight of 45kgs, the Super Jumper kids trampoline with handle is a great way for the kids to burn off that extra energy whilst having fun. Find the current cost for the Super Jumper here. If you’re looking for a trampoline for small yard, then the 8ft Lifespan Kids Hyperjump 2 Trampoline may be just what you’re after. Although a bit smaller than other trampolines, your kids will still have plenty of room to jump around and enjoy themselves. This trampoline comes with a range of features to help keep your kids safe. This children’s small trampoline has a reinforced safety net with heavy duty zip, reinforced welded joints, a heavy duty double galvanised steel frame, curved safety poles and wide safety pads to protect your child against injury. Another feature is the Smart Feet, the stability-enhanced feet that distribute the force evenly through even or uneven ground. The zinc-plated springs are designed to give the best bounce and have been heavily tested to ensure that you get quality springs. This trampoline has a recommended maximum weight of 100kgs and is also available in the larger 10ft and 14ft sizes and comes with a 12 months parts replacement warranty as well as longer warranties to protect against failure due to rust. Prices for the Kids Hyperjump 2 can be found here. The Lifespan Hyperjump 3 14ft Springless Trampoline is a springless trampoline that uses heavy-duty plastic straps instead of springs for extra safety and protection. No need to worry, though; the straps give just as much bounce as springs do, so your kids will still be able to jump as high as their hearts desire. To enhance the safety of this trampoline, this large trampoline for sale has Smart Feet, which are stability-enhanced feet that distribute the force evenly through the ground. The frame is double galvanised steel, the safety net is PE reinforced, the frame and straps are covered with PVC foam padding, and curved poles are fully padded. All trampoline components have been UV-stabilised, so they are super resistant to fading and degrading in this crazy Australian climate. The comfy stepladder and zipless entry make climbing onto the trampoline easy peasy, lemon squeezy. The recommended maximum weight for this 14ft trampoline is 140kg, so the neighbours can come over and bounce along with your kids. The Lifespan Hyperjump 3 Springless Trampoline also comes in 8ft, 10ft, 12ft and 16ft tramploine, and comes with a 12-month parts warranty and 10 year warranty against failures caused by rust and warping. Find current prices for the Lifespan here. 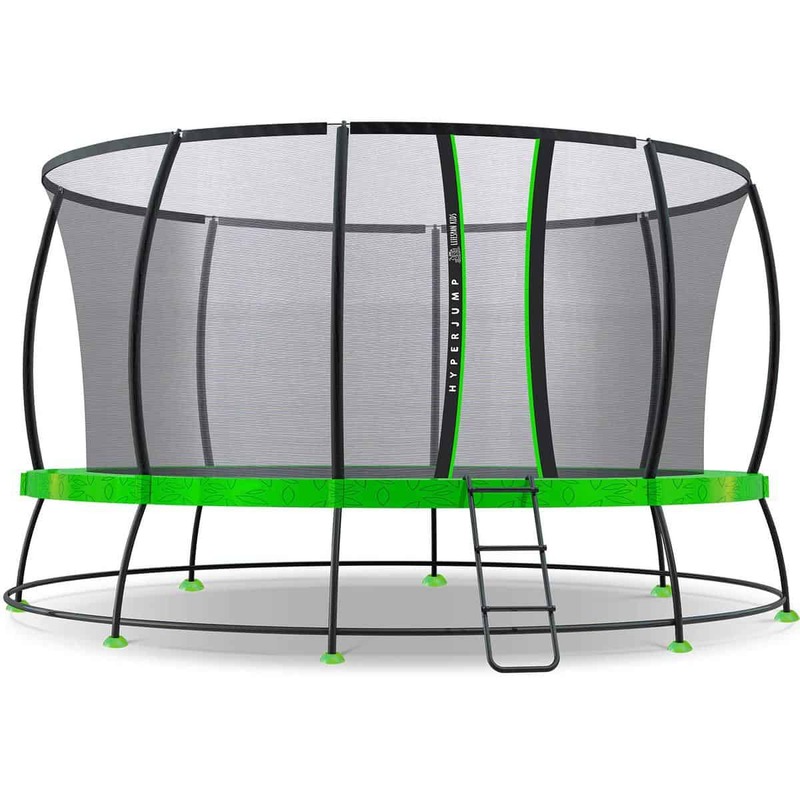 This 10ft trampoline by Plum is the class-leading trampoline in safety features and design due to its Springsafe enclosure and 3G Bubble Enclosure net. This Plum trampoline has 66 huge 180mm springs made from high-galvanised steel and finished in a gold layer that will not rust, corrode or break. The patented Springsafe enclosure design connects to the inside of the mat, preventing the potential risk of coming in contact with the springs and frame. Instead, if a your little one jumps off track, they will land on the soft mesh netting. The EVA foam that covers the curved enclosure poles and the thick PVC rubber mats have a high UV resistance and won’t disintegrate or fade, keeping your trampoline looking good for years. Another thing that sets the Plum trampoline apart from other trampoline brands are their patented weld-free brackets. They are 2.5mm galvanised steel that weigh 0.5kg each, and they add a huge amount of strength and stability to the joints & frame. All steel components of this trampoline have been galvanised inside and out to protect against rust, so it will give your family years and years of fun. The sky’s the limit with a Plum Premium Magnitude trampoline. Kids of all ages can join in on the fun, with a maximum weight limit of 100kgs. The Premium Magnitude Trampoline Range also comes in 8ft, 12ft and 14ft sizes, and comes with various warranty periods, including a 10-year warranty against frame failure due to rust. Check prices for the Plum Premium here. 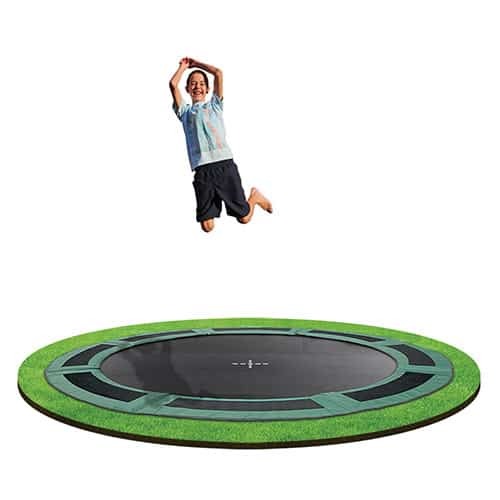 If you are looking for one of the small trampolines for sale, try the 6ft trampoline by Oz Trampolines. It is small but mighty; it can take a maximum weight of 180 kgs. The thick, UV-protected materials come in three great colours – pink, blue and green – and are built to suit the Australian conditions. The padding will protect against any spring injuries, and the ladder helps access the trampoline with ease. There is even a handy shoe holder to keeps neat and tidy. Providing everything you need for some bouncing fun, this 6ft trampoline comes with a 5-year frame warranty and 2-year parts warranty for your peace of mind. It is also available in 8ft, 10ft, 12ft, 14ft and 16ft sizes. 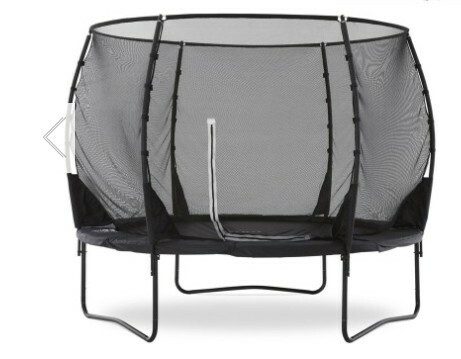 Find current pricing for this small trampoline here. *Crocodile Dundee voice* That’s not a trampoline; THIS is a trampoline! This is an ENORMOUS trampoline! And sometimes, bigger IS better! The HyperJump 3 Spring Trampoline by Lifespan will let your kids reach for the sky and experience the ultimate jumping high. This giant trampoline has 108 quality-tested zinc- plated steel springs. It has the same safety features as the Lifespan Hyperjump 3 Springless trampoline reviewed above: Smart Feet, the stability-enhanced feet that distribute the force evenly through the ground, a double galvanised steel frame, a PE reinforced safety net, PVC foam padded covered frame and springs, and curved poles that are fully padded. It also passes the international safety standards. Entry to the trampoline is simple with the comfy stepladder and zipless doors. To protect against the harsh Aussie sun, all trampoline components have been fully UV protected. This is a huge trampoline and will provide kids of all sizes and ages hours of fun. The recommended maximum weight for this 16ft trampoline is 140kg. Lifespan Hyperjump 3 Spring Trampolines also comes in 8ft, 10ft, 12ft and 14ft, and come with a 12-month parts warranty and 10-year warranty against failures caused by rust and warping. Check prices for the Lifespan Hyperjump here. When it comes to trampoline sizes, you will want to consider the size of your backyard as well as how old your children are. However, if space is not an issue then I’d recommend going for a fairly large trampoline – at least 10ft trampoline or even bigger. This way you will get longevity out of the trampoline as your children grow. Though it is worth noting that the bigger trampolines are not recommended for small children. Just remember when choosing your trampoline size, to leave some extra space around the trampoline so the kids have plenty of space room to move around the outside of the trampoline. Around 2 metres clear all around your trampoline is a good guide. The good news is that trampolines come in all sorts of sizes so there is bound to be the perfect size for your family. For your convenience I have listed the sizes of all the trampolines in these reviews in the chart above. Like the size of a trampoline, trampolines come in a range of shapes. These days a round trampoline is the most common type, however you can also purchase a rectangle trampoline, square trampoline and even an oval trampoline. One reason why round trampolines are so popular is that they are safer for children. 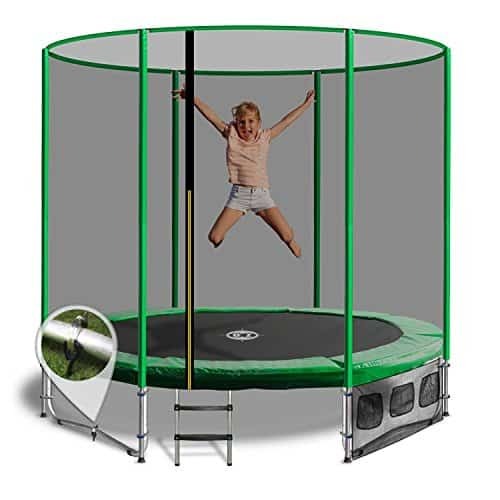 A round trampoline has much less bouncing power than a square or rectangle trampoline for sale, and kids tend to jump in the middle of a round trampoline. Rectangle trampolines are designed for older kids or those with more advanced skills. So, if your child is serious about trampolining, acrobatics or gymnastics then this might be the shape for you. The size of your backyard also needs to be considered when it comes to which trampoline shape to get, as a rectangle trampoline will take up more space. Different sized trampolines come with different maximum weight capacities. For example, a toddler or baby trampoline is only capable of holding one small child at a time, whilst a large 12ft trampoline can hold multiple children, or even adults at a single time. Consider the combined weight of your children, not only now but in the future too. If you have a few kids, you ideally will purchase the biggest trampoline for sale which can fit in your yard as it will have a larger weight capacity. Even if you are purchasing a mini trampoline for toddlers, in most cases you’ll find that a parent will accompany the child on the trampoline, so you will want to allow for this weight as well. 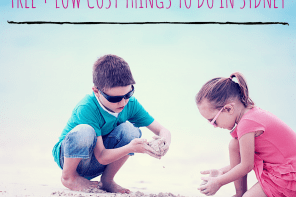 Plus, it’s much better to purchase a trampoline that your child can grow with, rather than having to purchase a new one once they outgrow the small kids’ trampoline. For your convenience I have listed the maximum weight capacity of all the trampolines in these reviews in the chart above. Of course, even the best trampoline ever comes with risk, but there are certainly things to look for to minimise the risk to your children. The current Australian standard for trampolines is AS 4989:2015 and is not mandatory, rather it’s a guide only. This means that manufactures don’t need to meet these standards in order to sell their trampolines. However, it is in the manufactures best interest to ensure the trampolines they sell meet these standards. Among other things the standard states that to avoid injuries a trampoline must have an enclosure and safety padding which completely covers the trampoline’s frame and springs. It is not recommended that you purchase a trampoline without these features. When it comes to padding over the springs, ensure the padding is well secured and doesn’t move around too much. Better still, you can purchase spring less trampolines which eliminate the risk of spring injuries completely. In terms of the enclosure net, be sure that there is no gap between the mat and net to avoid children slipping between the two. Given the harsh Australian climate, you want to ensure your trampoline is built to last. Look for things like a thick galvanised steel frame to prevent rust, as well as to ensure a strong sturdy frame. Also look for trampolines made with materials that have some sort of UV resistant coating, so it doesn’t easily deteriorate over time from being out in the weather. I’d also look for trampolines that come with lengthy warranties. The kids had a lot of fun on the old trampolines, but they fell apart fast and were dangerous. We were lucky no serious injuries happened. They last much much longer than the other brands. They just do. The new Smart Trampolines have sensors on the mat which detect movement and connect to an iPad or other tablet. The tgoma app has all sorts of games which kids can play. 4. You can bounce higher! Seriously, the kids and I feel so safe inside the Springfree that we really go for it. We can see into the neighbour’s garden if we jump really high with all our might. Because they don’t have springs adding extra width all the space is for jumping. You still need a good amount of space around them, of course. This is important for safety with any trampoline. If you register your trampoline, the net and mat have a two year warranty, the frame and rods have eight years. If a component wears out or your trampoline gets damaged in a storm, Springfree can help with finding spare parts. Our Springfree easily lasted for eight years of being well-loved and jumped on all the time. It doesn’t take more than two or three bounces to get my heart racing. Even a few minutes at a time has got to be really good for we adults. Using the tgomaFit for a longer workout is, of course, even better. My last top trampoline tip? Pay for an expert to set the trampoline up for you – it’s totally worth it. What’s your trampoline top tip? 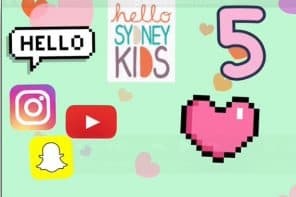 PS This post contains some affiliate links meaning that, if you buy an item using the link, a small commission is paid to support Hello Sydney Kids, at no cost to you. Read my full disclosure policy here.